Beverly and Baron Walker in their home on Milwaukee's north side about two months after Baron was released. WUWM's Teran Powell talks with Beverly and Baron Walker about how incarceration has impacted their family. 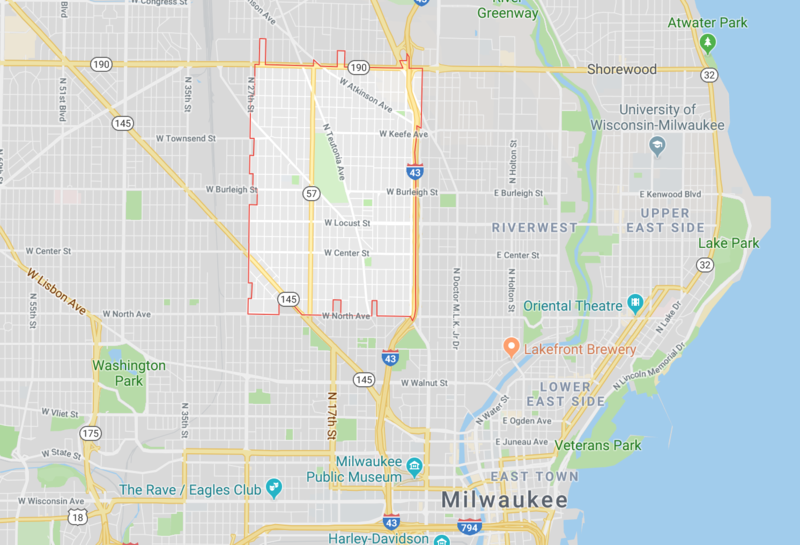 Milwaukee's 53206 ZIP code, outlined in red, is on the city's north side. WUWM first introduced you to the story of the Walker's in 2014 during a Project Milwaukee series focused on black men in prison. Baron Walker was convicted of two party-to-a-crime armed bank robberies in the 1990s and sentenced to a total of 60 years. But his wife described him as more than an inmate. “He’s just the love of my life. He’s my husband, he’s my support system, my best friend. He’s a father to our children. You know we’ve had children that have had to grow up without his presence. But he takes the time to record book readings for them. Then he records songs; he sings to them. And he cuts out coupons and mails them home. I mean everything that he does to help fill the void of him not being there,” she said in 2014. Fast forward to fall 2018. She was in the hallway of the Milwaukee Courthouse waiting for her husband to be released. And she was quite anxious that the day she’s been looking forward to for years has finally arrived. “I’m excited, I’m nervous. I really just don’t know how to feel,” she said. Part of the Walker's story has much to do with issues related to parole. Both say Baron Walker having to go before the parole board on six different occasions just to be denied every time was one of the most frustrating parts for them. “They would acknowledge all of my accomplishments. They’d acknowledge my institutional adjustment, that there was no problem, nothing but accolades. And I swear different people would just not pay attention to it. They’d just brush past it. They made it seem like it was all insignificant,” Baron Walker said about two months after he was released. He says the board put more emphasis on what he did 20 years ago than who he became 20 years later. “I never denied that I shouldn’t have committed this crime. I never denied that I shouldn’t have been with this crowd or what have you. I have accepted that. I accept responsibility for these things. I’ve apologized for these things, and I’ve decided to change and be a better person. You’re ignoring that,” he said. "I've apologized for these things, and I've decided to change and be a better person. You're ignoring that," Baron Walker said. Baron Walker also faced having to be a father and husband from behind bars. “My wife, she didn’t mind telling people, 'You know, my husband barely makes any money, but whenever he gets the opportunity to get this and he feels like I need it, he sends money home, he does homework with the kids over the phone.' I had them send their homework, and even if I didn’t know it, I’d go study. To make sure I gave them the information they needed so that they would do better in school,” he said. But his absence was still hard for the family to deal with. “My wife cried many nights, dealt with stress. And I dealt with always wondering about the possibility that these people would continue holding onto me without cause, and hold onto me too long, and then my wife – she just can’t take it no more; I wondered if it was a limit. The babies was getting older, and I was concerned because I’m like, 'OK, they’re getting of that age where people outside of the home can have an influence on them and I’m not there to have an influence on them or to give them that guidance that they’re going to need.' "
The couple's youngest children are budding teenagers. Now that Baron Walker's been home for about five months, the Walkers say their family is moving forward — with plans to bring more attention to mass incarceration along the way. It was hours of community advocacy, support from his wife, and powers within the criminal justice system that contributed to Baron Walker's release. And since then, he's even done some public speaking addressing mass incarceration. He also says he’s getting back to normal things like going to the movies, taking his driving test and getting used to working with touchscreen technology – that didn’t go too well the first few times. He joked about losing some of Beverly’s work while he was trying to figure things out. Despite the effects incarceration has had on his family, Baron Walker says he still has faith in the criminal justice system because to say otherwise would discredit those in the system who fought for his release.